Welcome to Forest Ranch! Explore this gorgeous home with SOLAR and GRANNY UNIT with our 3D Virtual Tour. Short 10 min. drive from Chico & youre in a scenic retreat away from the hustle and bustle of town. Located in a quiet, safe, gated community boasting a community pool, personal storage units, community water & septic, picnic areas & hiking trails. 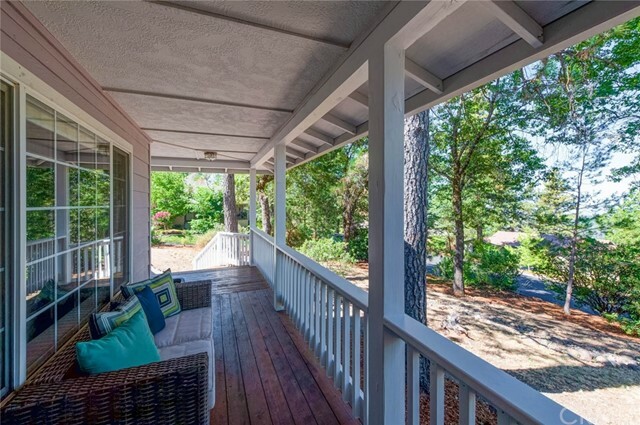 Overlooking Chico Creek Canyon sits a home with a picturesque covered front porch set up to relax with the breathtaking views. Inside, discover an open floor plan with new laminate hardwood flooring, 6 in. baseboards, 11 ft. ceilings and fresh neutral paint. Bright, welcoming living room features a rock surround wood burning stove. Formal dining room with large windows showcases the views & flows into a massive chefs kitchen including Oak cabinetry, tile counters, stainless steel appliances, pantry, eat-in dining nook & ENORMOUS center island-perfect for entertaining! 3 bedrooms and 2 bathrooms on the main floor, including master with dual vanity en-suite bathroom with a jetted soaking tub & LARGE walk-in closet. Above the over-sized attached garage is a Granny unit with separate HVAC, full bathroom, kitchenette, three closets & separate bedroom. Only 3 houses from a fire hydrant, the lot and entire community are professionally cleared of brush out to 200 beyond property lines. If youre looking for a little piece of serenity just a short drive from Chico, this is the home for you!